This edited volume examines theoretical and empirical issues relating to violence and war and its implications for media, culture and society. Over the last two decades there has been a proliferation of books, films and art on the subject of violence and war. However, this is the first volume that offers a varied analysis which has wider implications for several disciplines, thus providing the reader with a text that is both multi-faceted and accessible. This book introduces the current debates surrounding this topic through five particular lenses: the historical involves an examination of historical patterns of the communication of violence and war through a variety sourcesthe cultural utilises the cultural studies perspective to engage with issues of violence, visibility and spectatorshipthe sociological focuses on how terrorism, violence and war are remembered and negotiated in the public spherethe political offers an exploration into the politics of assigning blame for war, the influence of psychology on media actors, and new media political communication issues in relation to the state and the mediathe gender-studies perspective provides an analysis of violence and war from a gender studies viewpoint. 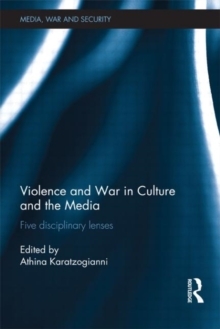 Violence and War in Culture and the Media will be of much interest to students of war and conflict studies, media and communications studies, sociology, security studies and political science.